DOES YOUR SUPPLIER DELIVER QUICKLY ENOUGH? 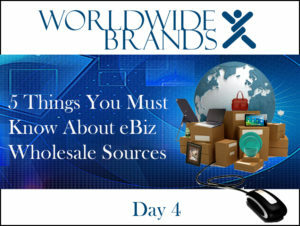 When people buy products from your EBiz, they generally expect delivery within just a few days. The quicker the better, of course. When you work with wholesale suppliers that are not 100% legit, (please read Day 1 of this series), you’re sending a product order up a chain of middlemen who each grab a bit of your profit for themselves and who would much rather go to the nearest Happy Hour and spend your money than actually forward your order email up to the next middleman in the chain with any alacrity. In other words, if you unknowingly used a fake supplier, you just paid a bad guy, and bad guys don’t care about YOU, they care about THEM. Working with suppliers like the ones described in Day 1 of this series (seriously, please read it if you haven’t already!) causes delivery delays to your customer that make you look bad. That’s in ADDITION to the fact that you paid too much for the product (fake supplier!) and hurt your profit margin. You don’t want to be sitting there listening to your customers complain about delivery times, especially while you’re trying to bandage your hurt profit margin. When you work with LEGIT suppliers (yes, Day 1 again…) your delivery times are always within customer expectations. Unless of course there’s a hailstorm that grounds UPS and FedEx planes or something, but that’s rare and when it happens, it happens to everybody, not just you. One of the ways you can tell if you’re working with fake suppliers is to talk to them about their delivery times. If they CAN’T GIVE YOU A DIRECT ANSWER, they’re probably FAKE. Ok, if you’re just not going to read Day 1, I’ll simply point out that in this particular instance I’m referring to companies that PRETEND to be real wholesalers, but actually pass your orders on to OTHER wholesalers who actually fill those orders. The fakes jack up your prices and hurt your profit margins. Sound far-fetched? It’s NOT. There are a LOT of those out there in all the dozens of sub-standard wholesale directories, and they promote themselves online as well. ANYHOO…real suppliers will always have good delivery times, fakes will not. One of the ways you can test delivery time is to order one of the products you sell from your wholesaler YOURSELF, and have it delivered to your house. You should always do that at least once in your business anyway; you DO need to understand what your customer experiences when they order from you. BUT THAT’S NOT ALL you should know. There are some amazingly twisted little schemes going on out there in the world of wholesale supply and drop shipping that impact delivery times. As one example, I’ve seen several Markesharks (have you read the rest of this series yet?) telling people to use sites like AliExpress as a source to buy ‘wholesale’ products and to have those products delivered to their customers via drop shipping. Yes, I’ve actually seen Markesharks telling people that. Do you have any idea how painful it is to laugh so hard that you actually sneeze Root Beer? Well, guess what I was doing the first time I saw that little gem being touted online? You guessed it. I was sipping Root Beer. Let’s break this down for a minute or three, shall we? We know that delivery time is critical in ECommerce. 3 or 4 days, no more than 5 days at the extreme outside is what you need for delivery time to keep your customers happy. If your EBiz is going to be successful, you need to work with real suppliers who provide real products at real profit margins. Do both of those statements make sense to you? Are we absolutely clear on those two points? Okay, good. Let’s take this Root Beer sneeze by the numbers. If statement #1 is true (and it is), WHAT SENSE does it make to use AliExpress for DROP SHIPPING? They ship their products from CHINA. CHINAAAAAA!!! In case nobody over at the Markesharks’ international headquarters in the Dewey, Cheetum and Howe building in central Utah has noticed, China is VERY FAR AWAY. Drop shipped products that are sent from China take WEEKS to arrive. WEEEEEEKS! How happy is THAT going to make your customers? Are you going to find REAL suppliers of REAL brand name products on AliExpress? I’ll let you decide how you feel about that question after you read THIS ARTICLE from BuzzFeedNews on CNBC’s web site. (Yes, CNBC. The big news company). Please do read it; it’s important. So, AliExpress…WEEKS to deliver, and THIS ARTICLE. You’re smart; you can draw your own conclusions. I’m just the messenger here. Oberlo is JUST A SOFTWARE APP that loads up Shopify (and ONLY Shopify, apparently) web sites with hundreds of products from ONE “wholesale source”. FIRST, just “loading up a web site with hundreds of products” is RIDICULOUS; a web site must be TIGHTLY FOCUSED into a single niche to ever be found online. SECOND, care to guess what Oberlo’s “wholesale source” IS? Yes, you guessed right again. After spending 24 years in this business, I shouldn’t be surprised by anything any more. Yet, once again, I find myself surprised. Look, I LIKE Shopify. I really do. They have a great ECommerce platform for online sales and I actually recommend it to people I teach all the time. But I just wish that for 5 minutes…just FIVE MINUTES…ECommerce Hosting platforms would stick to being ECommerce Hosting platforms, and quit trying to give ECommerce business advice. Just those few minutes would probably save hundreds of prospective EBiz owners from failure due to bad advice shoved down their throats by people who are NOT home-based business owners who actually SELL products online. ANYWAY, delivery times are important, REAL wholesalers deliver quickly through drop shipping and fake ones don’t, products shipped from CHINA take a LONG TIME to arrive, and beware of cyber-cloned minions who glad-hand “amazing apps”. Having been in this business for 24 years (as I said earlier), I’ve seen a LOT of EBiz owners who’ve been burned over lengthy product delivery times. You need REAL wholesale suppliers who are actually IN the country you’re delivering to! This entry was posted on Thursday, July 20th, 2017 at 11:39 am	and is filed under Online Business Advice. You can follow any responses to this entry through the RSS 2.0 feed. You can leave a response, or trackback from your own site.